February 13, 1950. 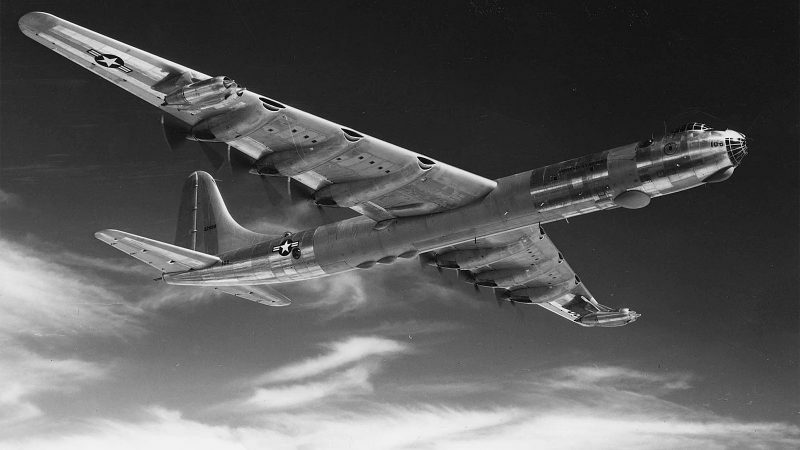 Dramatic story of a Convair B-36 B Peacemaker losing an Atomic Bomb! USAF’s Strategic Air Command’s long range Bomber ( with tail code 44-92075) was en route from Fairbanks, Alaska on a non-stop 3000 miles flight to Fort Worth, Texas. It was a test flight in extremely cold weather (-40 F/- 40 C) and included a simulated atomic attack on San Francisco, CA. For that purpose, the aircraft carried a nuclear bomb inside ( Mark 4, Fat Man) . Most probably due to icing in the carburetor air intakes of the mighty Pratt & Whitney R-4360 radial engines, the aircraft lost 3 of its 6 piston engines, something that would happen more often on this aircraft with its odd pusher engines configuration. While the plane lost altitude, it was decided to drop the 5 tons atomic bomb before the plane would crash , flying along the Alaskan Coast line into the Canadian Airspace of Northern British Columbia. Detail piquante: the bomb contained a substantial quantity of natural uranium and over 2 tons of conventional explosives. The USAF always denied the presence of plutonium, preventing an accidental nuclear blast in case of an emergency. The flight of an early type Consolidated/ Convair B-36B Peacemaker, without the 4 Jet engines that would feature on later models in a set up under the outer wing panels. The Jet engines were not intended to be active during normal flight conditions, those gas-guzzlers only went on in case of emergency when confronted with enemy fighters or flying over hostile terrain (read Russia). As the plane was doomed with 3 engines out and the 3 others not capable to run on full power , the crew decided to bail out by parachute , rather than trying to land. Flying over Princess Royal Island, they tried to fix a dropping zone over land, but the timing of the first jumps was miscalculated and 4 of the 17 crew members landed in the sea, they all drowned. 1 member never jumped and 12 others survived but it took quite some effort to track them in the barren remote land. And what happened with that lost Nuclear Bomb? According to official sources, it was detonated in mid-air after it was dropped from the crippled B-36’s bomb bay. But there are also reports that stated that the bomb only exploded as it hit the ground somewhere in Northern BC. Evidently, the uranium was never recovered . But there were more surprises to come. Before the pilot jumped out, the stricken aircraft was set to fly on automatic pilot, hoping to make a final plunge in the deep of the Pacific. Due to that information, there was no further search made for the lost B-36. However, 3 years later the wreckage of the B-36 was spotted by a Canadian Search plane, rather intact on a location near the remote Nass Basin, NW of Hazelton, BC. USAF rushed out to the spot as they surely had a few things to recover from that plane before others would be able to get there. Explosives were used for partial destruction after crucial components were taken out and the location was kept “secret”, while many locals must have known about the site. New expeditions in 1956 and much later in 1997 were undertaken, followed by small scale salvage expeditions to retrieve instruments, and parts of a gun turret ( all on display in the local Bulkley Valley museum in Smithers. BC). The site is now declared protected and has forever a link with the first ever loss of an Atomic Bomb during a USAF flight. There would follow at least 7 more incidents in which US Nuclear weapons were involved/lost. 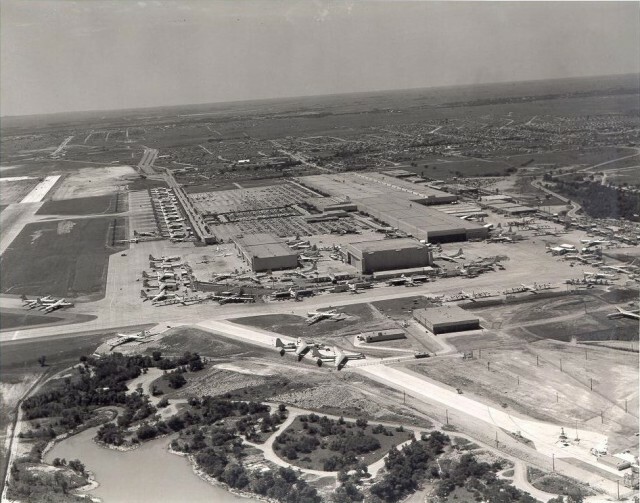 The Texas plant of Consolidated/ Convair where a total of 385 B-36’s in all variants were built from 1948 to 1959. The B-36 was a huge plane with its wingspan of 230 ft (70 m) which is big, even in today’s standards. It was USAF’s first long range bomber that could deliver a nuclear bomb over almost any place in Russia due to its flight range of 10.000 miles (16.000 km) . Its payload of 33 tons allowed the hauling of the Thermonuclear and Atomic bomb with sufficient fuel and oil on board to feed the 6 thirsty piston engines R-4360 on their way to Moscow and back home, and at a flight level of 40.000 ft, well above the Russian detection range of their radar systems. In an era that the Cold War developed into more hostile confrontations between the Super Powers ( from the no bullets-show down of the Berlin Blockade to the Korean War was a major escalation), there was no Intercontinental Ballistic Missile existing yet that could make an efficient nuclear deterrence, so the B-36 was the only capable delivery platform at that time which could make some threatening impression on USSR and China. Yet, the arrival of the Russian Mig 15 Jet fighter on the scene in the Korean conflict was a clear sign on the wall: the B-36 was too slow for such interceptor, i.e. the sluggish bomber would be extremely vulnerable in a nuclear attack flight over Russia. The Pratt & Whitney R- 4360 aero engine heralded the final development in big radial piston engines. The Brute cranked out 3.800 hp in later versions from its 4360 cubic inches (almost 72 litres of displacement from 28 pistons, equivalent of 45 Harley Davidson V-2 engines of 1.600 cc), With its 4 rows of 7 cylinders stacked around the crankcase it had the looks of a giant corn cob and subsequently got that nickname. It had double spark plugs in its 28 cylinders, making 56 spark plugs per engine. 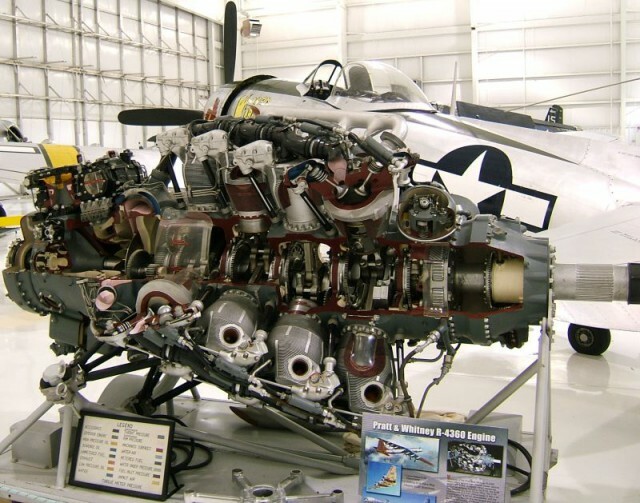 The R-36 with six engines had a whopping total of 336 plugs, a day of work for a wrench jock to replace them all. There was a super charger mounted ( you can see that on the opposite side of the Prop shaft) and for more hp output, there came on top 2 turbo chargers. The huge propeller was linked via a gearbox to the engine in order to reduce the prop’s revs and avoid the prop tips to reach supersonic speed. Apart from the terrible noise, that condition would be inefficient in propulsion. As you can see on the photo above, there were a zillion moving parts of pistons, rockers, valves, push rods, big ends, gearboxes, etc. A very complex machine that was vulnerable due to the high mechanical and thermal stress on all those components. The Wasp Major was more or less the ultimate radial, that also powered contemporary big Prop liners as the Boeing Stratocruiser, but in that aircraft the engine was used in the tractor configuration with the prop in front. 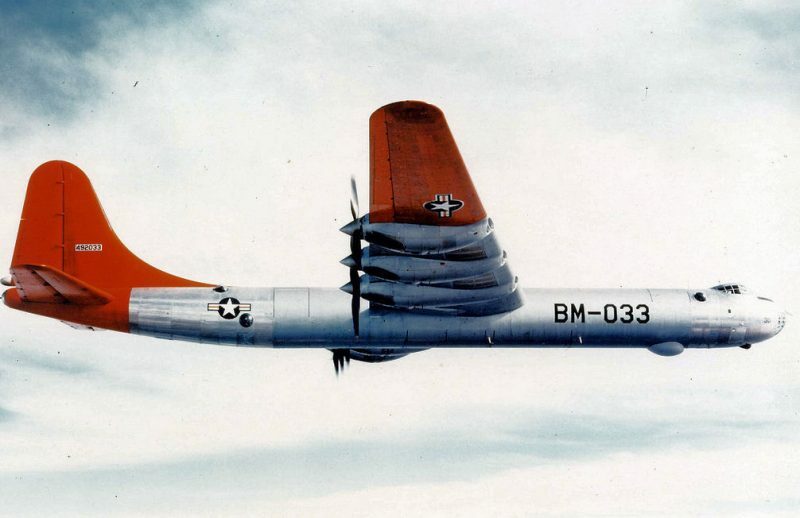 With the B-36 , the reputation of the R-4360 was best described as “temperamental”, but that had a lot to do with the Pusher Prop configuration. According to my friend Dirk Septer , the carburetor air intakes did not get the warm air heated first by the cylinders (as in normal tractor set up) and therefore were prone for icing in the extremely cold weather of the Arctic. But also the cooling of the cylinders played up , which could result in overheating and even engine fires. The capricious multi row ’round’ piston engine for big aircraft had found its technological limitations, its career came to a close as the Jet engine (and the related Turbo Prop) came available. The Jet is basically a much simpler design of engine, with way less moving/ reciprocating parts and a big step forward in the power-to-weight ratio. Where the Corn Cob was running to a power output ceiling of max 4.300 hp ( 3200 kW) with a weight of 3900 lb ( 1750 kg), the Jet development did not meet any power output limits yet. In 60+ years there is still progress in thrust and fuel economy with every new jet engine design. Wasp Majors were produced between 1944 and 1955; 18,697 were built, they were made for the last of the Large displacement “Piston Props”. Its successor in the USAF, the Boeing B-52 with full Jet propulsion must have been welcomed as a relief in terms of serviceability and reliability . This picture above shows the giant leap forward that was made in the mid 1940’s in aviation construction technologies. 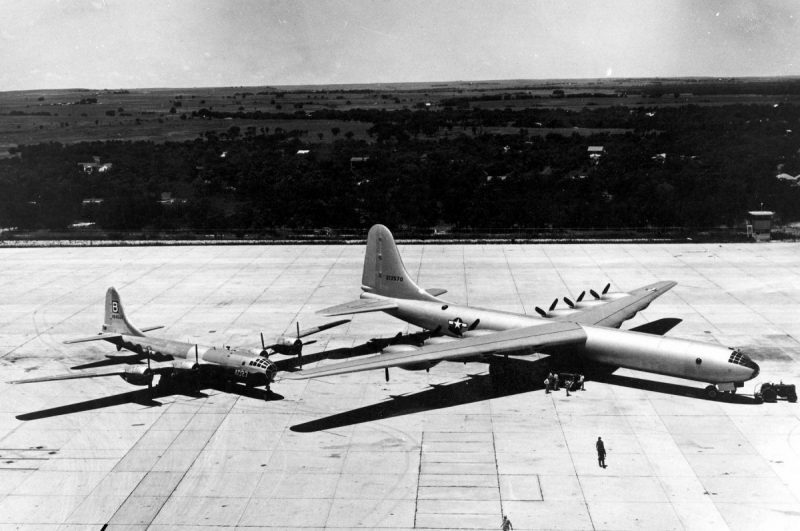 The B-36 dwarfed the Boeing B-29 Superfortress, the Hero of the Pacific War , that brought Japan on its knees in Aug 1945. Less that 4 years later , the B-36 rolled out of the semi open air assembly lines (no hangar was big enough at the time to fully house the Bomber). With two bomb bays, the plane could carry the largest thermonuclear warheads existing of that time (Mark -17, 19 tons!) . There came superlatives for the plane, it was called the “Aluminum Overcast” due to its huge size, but also “SAC’s Long Rifle”, (evident with a flight range of 10.000 miles), but others had less positive nicknames reserved. What about the “Billion Dollar Blunder”? True or not, I saw the B-36 in the National Museum of the USAF in Dayton, OH , where you can walk right under its open bomb bays and that was an impressive sight for sure. With a length of 50 meter and a wingspan of 70 m , all that stuff made flying in the late 1940’s , that is worth a compliment as being a technological achievement of exceptional allure, in which lamentation about its costs has no longer any arguments. The B-36 claimed its place in the History of US Nuclear Deterrence, as being the first ever aircraft that could deliver the atomic bomb over 10.000 miles, right into Russia. Fortunately, that capacity of the B-36 was never deployed, most likely thanks to its sheer existence, a real Peacemaker!